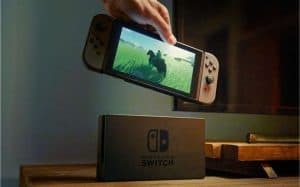 Nintendo Switch Features 720p Screen With Multi-Touch | Nerd Much? The Nintendo Switch features a 720p touchscreen according to new reports. Better yet, it will supposedly be the first Nintendo console with multi-touch. A few sources have told Eurogamer that the capacitive touch screen will be 6.2 inches in size. Normally, we would tell you to take this with a grain of salt, but these are the same sources that originally revealed that the Nintendo Switch features its hybrid design with detachable controllers. This is a big move for Nintendo as previous iterations have been single-touch resistive screens. In either case, this could possibly fragment the games that can be played on the TV versus on the go. However, these same sources detail a way around this issue. The right Joy-Con controller is said to have an infrared sensor so it can be used as a pointer on the TV. The docked console will contain a sensor. This will allow the pointer to function very much like a Wii remote. It should also be noted that the 720p resolution only applies to the handheld screen. The sources make no mention of what the Nintendo Switch can output while docked. Still, this is still speculation until they finally unveil all the Nintendo Switch features on January 12. For now, we will continue to ponder what we know.